Jurgen Klopp declared West Ham a “completely different cup of tea” to the side Liverpool faced at the start of the season, ahead of Monday’s clash in Stratford. 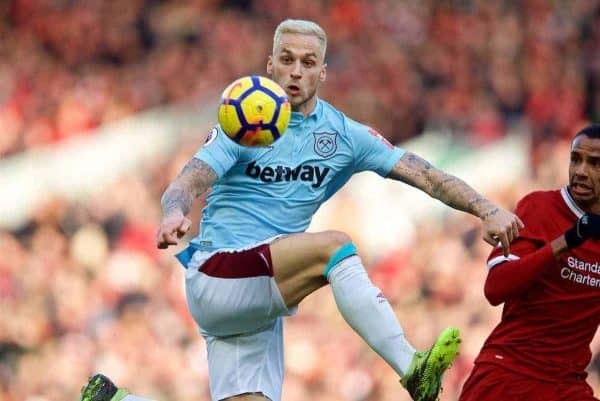 The Reds thrashed Manuel Pellegrini’s side 4-0 at Anfield on the opening day of the campaign, with the Chilean fielding five new signings in his own first competitive game as Hammers manager. A disjointed West Ham side took to the field that day, and struggled in the opening weeks, but now they sit 12th in the table and have picked up victories over Everton, Man United and Arsenal among others. Though they are on a run of three consecutive losses, Liverpool learned that is no factor when they drew 1-1 with an out-of-form Leicester in midweek, and Klopp told reporters on Friday he is expecting “a lot” from Pellegrini’s side. “We started the season against West Ham with a brilliant game for us and not a very good game for West Ham,” he recalled. “That day they had a lot of new players, new manager, all that stuff, and we were strong, so that made life quite uncomfortable. “Then they still had a couple of weeks where they really had to fight together, but then they did it. “They are one of the strongest teams, really bad start and since then they are pretty much nearly a top-six side. “That’s what we should expect. The most experienced manager in the Premier League at the moment, really good football team. “Really good signings in defence, experience in the full-back positions, Rice [has made a] fantastic development this season next to Noble—experience and youth. “Then you have the wings, really strong, Anderson fantastic signing, and Marko Arnautovic, outstanding striker. “Having Samir Nasri now around, Snodgrass [on his] second, third or fourth wind, really back on track, and Fabianski in goal! “That’s a really good football team, so that’s what we have to be ready for again. Klopp also discussed Lazar Markovic‘s last-minute move to Fulham, his belief in Naby Keita, Trent Alexander-Arnold‘s return and an unfortunate setback for Joe Gomez. Despite drawing with Leicester, the Reds are now five points clear of Man City at the top of the Premier League, and the hope will be that Arsenal can deliver another blow to Pep Guardiola’s title hopes on Sunday.